The wait is over because the classy and trendy collection by Cross Stitch has been launched in the form of eid festival collection 2015. Lastly the collection is present in different branches and outlets in various cities. The customers are coming to shop this new eid collection 2015 by Cross Stitch and to get a best clothing experience. Cross Stitch is considered as one of the best and leading clothing brand in Pakistan and has huge customer base in Pakistan as well as in other countries. Cross Stitch lawn 2015 that got tremendous response from customers in Pakistan, which is truly launched for eid by Cross Stitch contains embroidered as well as printed dresses made of lawn, chiffon as well as cotton. Readymade party dresses in the form of single shirts are also presented by Cross Stitch. Cross Stitch Eid Lawn Prints 2015 Collection has launched royal prints and the model hired for the campaign is Sadia Ali who is a hit model now days in Pakistan. Cross Stitch Eid collection 2015 is designed by getting inspired of floral designs as well as artistic patterns. The most dominant product in this collection is threading embroidered dresses. Only thread work has been focused by the designers rather than tilla work or usual embroidery. This collection is signature digitally designed. The designers have focused on decorating the dresses with thread work, stone work, embellishments, prints etc. 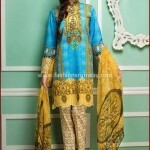 the golden toned embroidery has been emphasized by the designers so that they can look awesome on eid. Cross Stitch eid lawn prins 2015 collection is composed of thirteen dresses and they are three piece. The flowery patterns and designs can be seen with different shades and combinations. Cross Stitch eid collection 2015 contains two types of designs for both girls as well as for women. The model has presented this collection in an awesome way. The colors which are focused by Cross Stitch are green, blue, pink, orange, yellow, parrot green, purple as well as brown, majenda and various other fresh colors. Check below here Cross Stitch designer embroidered eid collection 2015 for women.